No longer is the bathroom just a wash room with a cold atmosphere and a single purpose. In new and renovated homes, the bathroom is increasingly becoming a zone of luxury and relaxation – a soothing sanctuary in which to escape the stresses of a long day. Nothing emits peace and tranquility more so than a nature-inspired bathroom – one that brings the outside in through the use of organic shapes, natural materials and textures, and an abundance of natural light. Adding plants and flowers into the bathroom are the simplest and most obvious way to bring nature into the bathroom. Succulents and potted plants are easy to care for and make any room feel more vibrant and fresh. While plants are a great way to improve the aesthetics of the home ad create a unique space, they are also great for improving the air quality, releasing oxygen and reducing the amount of dust in the air. Natural stone such as slate, marble, granite and travertine add texture and substance to the space and will complement timber accents beautifully in a nature-inspired bathroom. 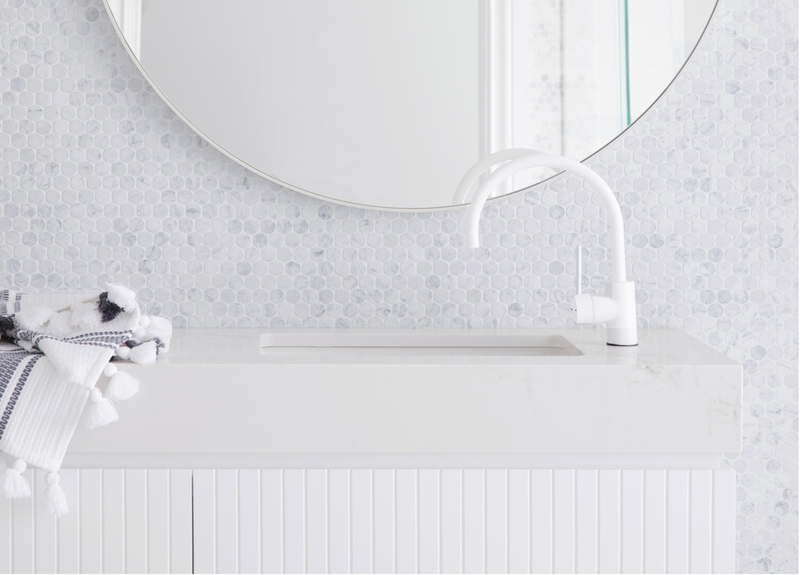 To save on costs, consider using a smaller quantity of natural stone as a feature, such as the vanity benchtop, an organically shaped natural stone basin, or a stone tile feature wall. Wooden finishes are also a great way to transform the atmosphere into a tranquil space- wood is the warmest natural element you can bring into the space. Try adding some rich wooden textures in the addition of construction, such as a vanity top; or simple décor for a simple transition of the environment into your home. Ensuring an abundance of natural light in the room is a fantastic way to connect your bathroom with the outdoors. Utilise mirrors, reflective surfaces, a large window and perhaps even a skylight to let the light in and help make your bathroom feel more spacious. Focus on the tranquil element of water by incorporating indulgent pieces such as a freestanding bath and luxurious rain shower to wash away your cares at the end of a hard day. Complement these indulgences with some elegant tapware and bathroom accessories. Subtle touches of luscious greenery and some plush towels in warm natural tones will also help to soften the hard surfaces and complete the look of your nature-inspired bathroom.